Since I've been neglecting my stamps, I decided to just open one of my stamp drawers, grab out a set, and make a card with it. Here's what I came up with. markers: Copic (used to color them and also I used it to [crudely] add color outlines to the rectangles). buttons: I *think* they're from Oriental Trading and I used thin cuts of paper to make the 'thread'. It's so cute and what a fun, fun card! What a wonderful boy's card, love these cute little images. Great images for a "guy" card! Nice choice of colors! Love the robot! Yup, I love it and regret not getting that set from SU! It is a classic with images that will never go out of style! This is so stinkin' cute! What a fabulous card for a young fellow ... or even older fellow! I love this Gale! Yay! Thanks for entering, Gale!! 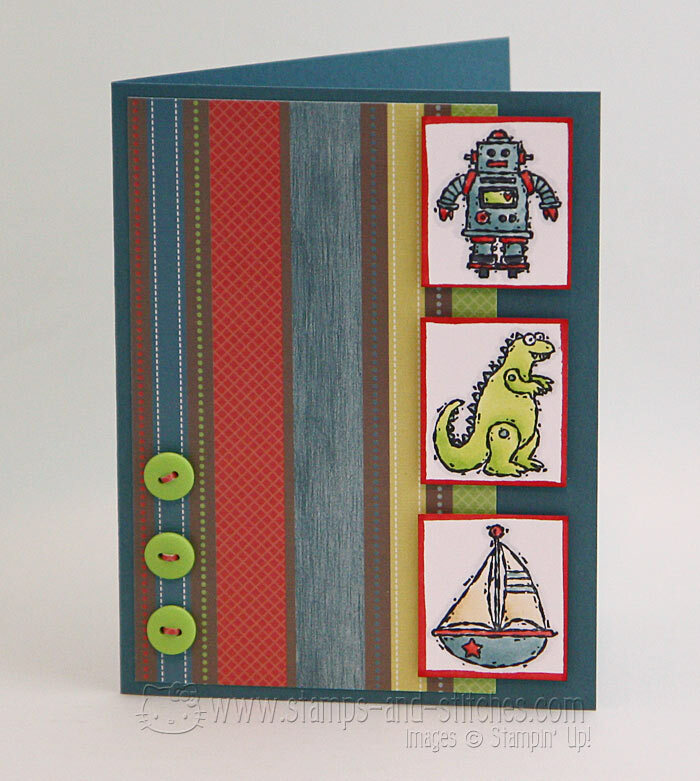 Cute kids card. I love this set. Awesome masculine card, Gale!! Love it! Love this. This was one of my very fist stamp sets. I haven't used it in forever but I think you have inspired me. Hope you had a wonderful Mother's Day today. Great card! I find it so hard to do boy/male cards. Love it! What a great little boy card.